On Saturday, President Donald Trump said that he would pull the united States from the Intermediate-Range Nuclear Forces Treaty with Russia due to his claims, which were not in detail, that Moscow had violated the treaty. "We are going to terminate the agreement and then we are going to develop the weapons" unless Russia and China agree to a new deal, said Trump. “Russia has violated the agreement," Trump continued. "They’ve been violating it for many years and I don’t know why President Obama didn’t negotiate or pull out. Due to a lack of details on the subject, Trump was asked to clarify his statements and actions. Trump made the announcement following a campaign stop and Make America Great Again rally in Elko, Nevada. National Security Adviser John Bolton was headed Saturday to Russia, Azerbaijan, Armenia and Georgia. An administrative official, speaking on the condition of anonymity,told Fox News earlier this week that Bolton would be informing Moscow of the INF pullout during the trip. The 1987 treaty signed by President Ronald Reagan and Russian President Mikael Gorbachev was produced in an effort to protect our security and our European and Far East allies. It prohibits both the US and Russia from possessing, producing or test-flying a ground-launched cruise missile with a range of 300 to 3,400 miles. 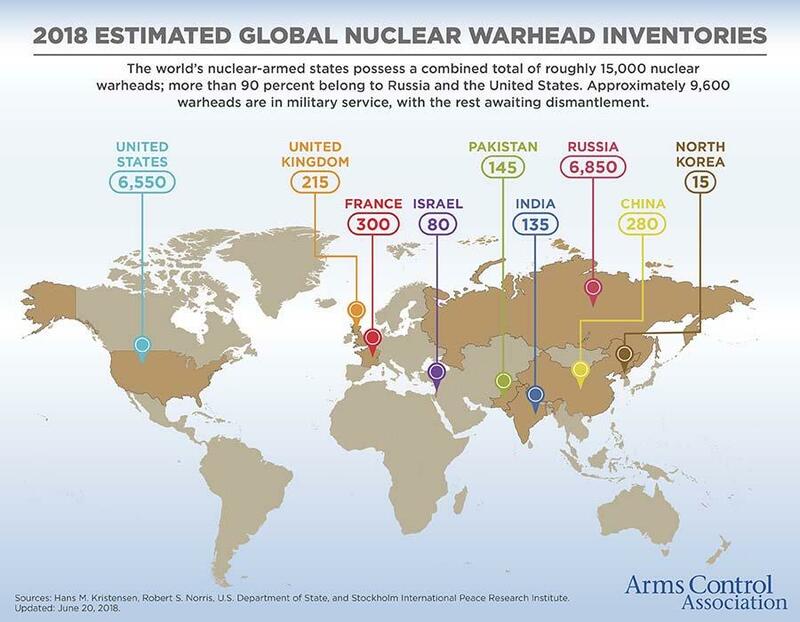 According to the Arms Control Association, the US is just behind Russia in the number of nuclear weapons we have in our arsenal. February 2018 New START declaration: 1,350 strategic nuclear warheads deployed on 652 ICBMs, SLBMs, and strategic bombers. FAS estimates approximately 4,000 stockpiled warheads and 2,550 retired warheads for a total of 6,550 warheads as of February 2018. February 2018 New START declaration: 1,444 strategic warheads deployed on 527 ICBMs, SLBMs, and strategic bombers. The Federation of American Scientists (FAS) estimates approximately 4,350 stockpiled warheads and 2,500 retired warheads for a total of roughly 6,850 warheads, as of early 2018. While the treaty specifies ground launch missiles with a range of 300 to 3,400 miles, ICBMs begin at minimal around 3,400 miles in range and increase up to 9,321 miles. I don't profess to be an expert on the subject of nuclear weapons, but it seems a bit silly to quabble over missiles that have less range than those we possess that we can fire with precision at virtually any place on the Earth. But I digress.